Durango Young Americn Football League sixth-graders, from left, Connor Jones, Otto Aaland and Cully Feeney, go in for a tackle on a Cortez player last Saturday. The Demons won 37-26. The opening week of the season for Durango’s Young America Football League was successful, as two of four teams in action got victories. One more team will have its first game Saturday. Durango’s third-grade team was the most impressive of the bunch with a 19-0 shutout against Aztec. Malique Rodriquez found the end zone two times for the Demons, while Jerad Lopez added another. On defense, Darion Allen, Oliver Nez and Stetson Coulier kept Aztec on its half of the field for the majority of the game. In addition, Isaiah McCrady, Owen Erwin and Rodriquez used their speed to close in on Aztec’s rushing attack. Third grade will look to remain undefeated against Farmington at 1 p.m. Saturday at Miller Middle School in Durango. Despite giving up 26 points, the defense also forced four turnovers, including two interceptions from Dugan, who also had four tackles. Feeney had a scoop-and-score touchdown. The Demons will look to continue their impressive offensive form when they take on Bayfield at 5 p.m. Saturday at Miller Middle School. 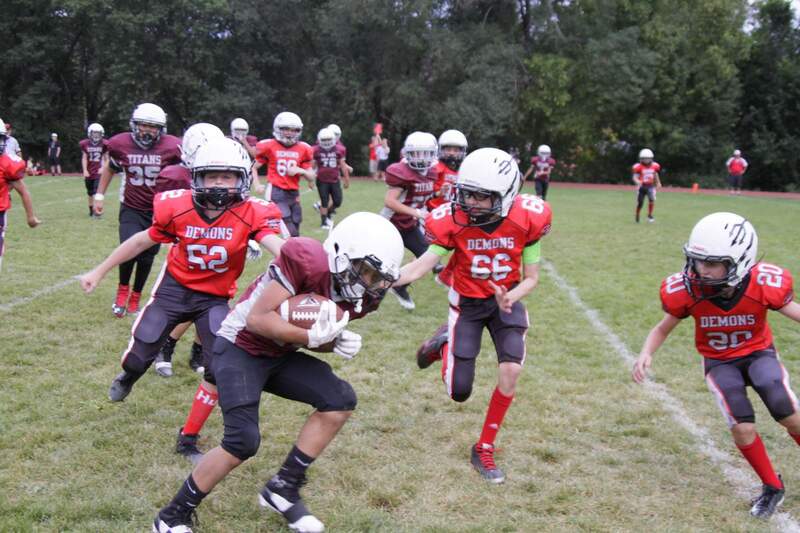 At the fourth-grade level, the Demons fell to Aztec in a close 7-0 loss. After Aztec scored on its opening drive, the game remained a stalemate, with neither side giving up much ground. On offense, the Demons were led by Blaze Aguilar, who completed several long runs but ultimately was unable to find the end zone. The Demons will look to get on the win column for the first time against Farmington at 9 a.m. Saturday at Miller Middle School. The fifth-grade team was handled by a tough Bayfield side, falling 24-6. Quarterback Brady Hoerl threw for 75-yards, including a 43-yard touchdown pass to Griffin Connolly for Durango’s only score of the game. Connolly was the Demon’s leading receiver with 59 yards. The Demon defense held firm and was down 12-6 in the third quarter when the game was delayed because of lightning. After the delay, Bayfield’s offense came alive in the fourth quarter with two more touchdowns to put the game out of reach. The fifth-grade squad will look to get back to winning ways against Farmington at 11 a.m. Saturday at Miller Middle School. The second-grade Durango team will open its season with a trip to Farmington at 11 a.m. Saturday.